Or view larger version. Midcontinent. August 10, 1938. Dorothea Lange. Gelatin silver print. Collection of Oakland Museum of California. Gift of Paul S. Taylor. 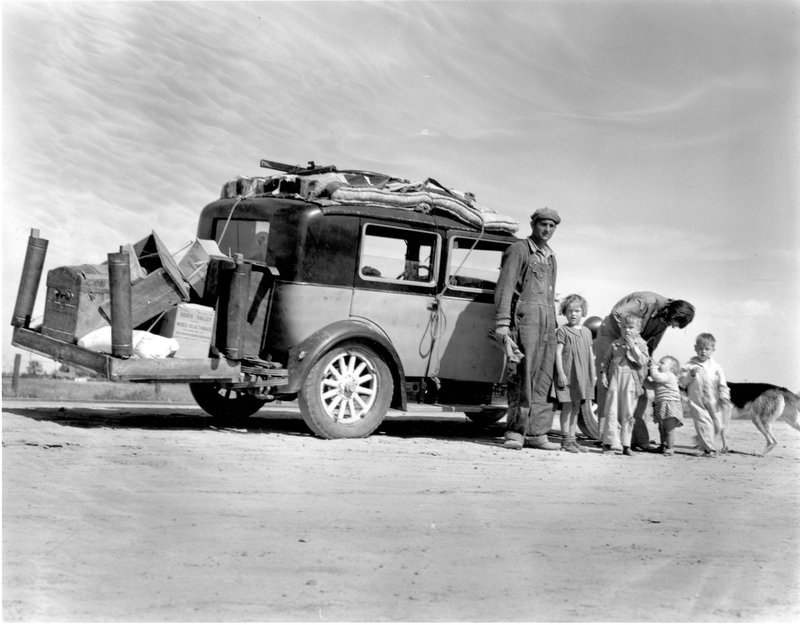 This photograph shows a Depression Era family standing outside of their car. Because of a terrible drought in the 1930s in the southern Plains of the United States, many farmers and farm workers left failed farms for work in California. Of the 5000,000 people who fled the southern Plains, some 200,000 migrated to California. Many farmers were drawn to California because of the cotton crop, which had an impressive 600,000 acres of fields in the San Joaquin Valley alone by 1937.